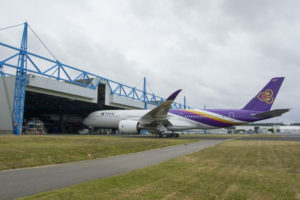 The first A350 XWB for Thai Airways has rolled out from cabin furnishing & engine installation at the Airbus Toulouse Final Assembly Line. The aircraft is now ready to proceed to further ground and flight testing. This first A350-900 for THAI is scheduled for delivery in Q3 2016. Bringing new levels of efficiency and comfort in the long range market, the A350 XWB family will be especially well suited to the needs of Asia-Pacific airlines. Firm orders from carriers in the region for the new aircraft already total 267, representing over a third of total sales for the A350 XWB to date.